As she lived in complete silence , she departed our world in even more silence that does not suit a figure like her. After all she was not only the surviving sister of late King Farouk but she was also the ex-wife of Shah of Iran Reda Pahlavi. Princess Fawzia Fouad passed away last July 2,2013 in complete silence in Alexandria. Her very small funeral that did not suit her was held last July 3, 2013 from El Saida Nafisa mosque in old Cairo. She was not buried in the royal cemetery besides her brother late King Farok in Rafai , she was buried in her husband's family "The Shereens" cemetery in Cairo. Only very few relatives attended the funeral. Of course the media was not that interested in covering the funeral but I found couple of clips from the funeral. The media was not that interested because it is not a secret that we are having political unrest in the country. I do not know what to say about that beautiful princess honestly as I have always admired her as a person and as a royalty figure. In 1939 the 18 years old Princess Fawzia married crown the 20 years old prince of Iran Reda Pahlavi in one of the most famous political marriages in the Middle East in the 20th century. It was said that king Farouk tried to lead the Muslim world and at the same time Pahlavi was trying to support his rule with a regional alliance, a great one too.Of course my generation looks to it as when a Sunni princess married a Shia prince and everyone was happy for it. Princess Fawzia gave a birth to Princess Shahnaz Pahlavi in 1940. Princess Fawzia with Princess Shahnaz in Iran "Hassan Kamel"
Amazingly Princess Shahnaz is just like her mother , a media shy person who is living away from lights unlike the rest of her family. Unfortunately the princess that became a young beautiful Queen returned Cairo in 1945 leaving her daughter in Tehran. The sad look of the princess since then became her trademark. Many people spoke about why the royal-imperial marriage did not work but the young princess who came from different royal court and different country could not coup with her mother in law and sisters in law not to mention the young Shah had a mistress. I once read the memories of Adel Thabet , King Farouk's relative that the young Queen was extremely depressed to the level that she fell sick, extremely sick. After knowing what happened to his sister , Farouk ordered her return immediately to Cairo to be divorced. In 1949 she married colonel Ismail Chirine , another Mohamed Ali family member and an army officer/diplomat. They were considered the most cutest couple in Egypt then according my grandma. The princess got two children : Nadia and Hussein. After 1952 , the citizen Fawzia carrying her son Hussein "Kelisi"
It is worth to mention that Nadia Chirine was the first wife of famous actor Youssef Shaaban. Princess Fawzia was like an acting first lady of Egypt till the short marriage of King Farouk from Queen Neriman especially with the departure of Queen Nazli to the States. In 1952 the princess who was married to the minister of defense then was said to predict that something was going to happen and it did happen. The free officers did their own coup which was regarded later as the 1952 revolution n Egypt. She refused to leave Egypt unlike the rest of sisters. She lived in Alexandria along with her husband and her children Nadia and Hussein. Princess Fawzia led very extreme quiet life refusing to speak the media decades even in time of Mubarak. 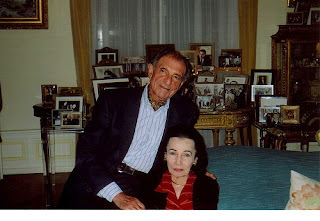 The only recent photo for the princess we found it in her daughter's ex-husband Ardeshir Zahedi's website during her visit I think to the States from a decade ago. Of course my generation rediscovered her from the old photos thanks to the Nostalgia to the old black and white Egypt. Now I know this is not a proper obituary for such personality. Below one of the biggest flickr photo album dedicated Princess Fawzia. Please pray for her or read the Fataha on her soul. R.I.P. Thank you for sharing the photos and obituary. I think it was appropriate and very nice of you Zee. You have a big heart. This gives the impession that Fawzia's sisters left at the time of the revolution but that she chose to stay behind when her brother went into exile with his young family. In fact, her sister was already living with their mother, Queen Nazli, in California after Farouq had disinherited and disowned them for failing to follow his orders and return home from what was becoming a scandalous overseas adventure. One sister married a Egyptian ex-diplomat [who was Coptic] who shot and killed her. Queen Nazli died penniless. She had earlier converted to Catholicism and is buried in a Catholic cemetary. I wish there would be more books and articles on the Egyptian Royal Family. Those who are looking for an interested book, please read " A KIng Betrayed" by Adel Sabit. FABULOUS! Thank you for this tribute to the late Princess Fawzia Fuad; her exquiste photos have more than stood the test of time. A timeless, rare beauty. And without doubt: an enduring one. Her memoirs would have been a priceless treasure and testament to a world in monumental transition. She really was a unique witness to history. Thanks again for this sweet page. Zeinobia, kudos on your thoughtful, enlightening blog; I have learned so much. Your late Princess Fawzia Fouad understood the power of silence: her mystique prevails. She remains as Egyptian as a sphinx. Please enlighten me. What is the meaning or connotation of the name "Kelisi"? I infer that it is a term of endearment, to wit, Princess Fawzia Fouad's 'nickname' for her son (see photo above). Thank you so much.